Adult. Plumage is very variable. The Rock Pigeon, formerly known as the Rock Dove, was introduced to North America in the early 17th-century by colonists on the Atlantic coast and is now a common sight in urban areas from southern Alaska across North America to the tip of South America. Native to Europe, North Africa, and most of Asia this species was domesticated over 5,000 years ago for food and entertainment. It is the most intensively studied bird in the world. While most Rock Pigeons nest on human-made structures, many can be found on natural cliffs in Tennessee. 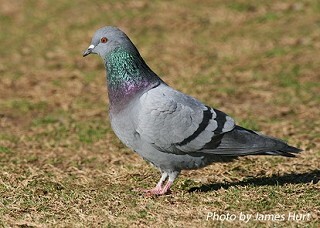 Description: Because of their domestic roots, Rock Pigeons have a variety of plumages from pure white to gray to solid brown. The most common plumage is similar to the ancestral wild Rock Pigeon, which is overall gray with a white rump, two black wing bars, a rounded tail with a dark tip, and iridescent purplish green on the neck and head. The sexes are similar but males average larger and have more iridescence on the neck. Voice: A soft, series of gurgling coo-roo-coo. Mourning Dove are slimmer and have longer, pointed tials with white outer tail feathers. Eurasian Collared-Dove are pale sandy gray overall, with a square tial, and a narrow black half-collar on the back of the neck. Habitat: Urban and suburban areas, parks, agricultural areas, fields and farms with grain silos, industrial parks, rail yards, and occasionally rocky cliffs. Diet: Seeds, fruits, rarely invertebrates. Nesting and reproduction: Usually gregarious, pairs often nest close to each other. In Tennessee, the nesting season extends from at least January through September. Rock Pigeons will produce two or three broods in a season. Clutch Size: Usually 2 eggs, occasionally one. Incubation: Both parents incubate the eggs for 16 to 19 days. Fledging: The young are fed "crop milk," a nutritious fluid produced by both parents. Seeds are added to the diet as the young mature. They leave the nest at 25 to 26 days old. Nest: The nest is a flimsy stick platform built under cover on building ledges, in barns, under bridges and occasionally on natural rock ledges or quarries. Nest sites are often reused with a new nest being built on top of the old one. Pigeons do not remove the feces of their nestlings and the nest turns into a sturdy mound that gets larger month by month. Status in Tennessee: Common permanent resident in urban and agricultural areas across the state. The Tennessee population is stable or possibly increasing. Most Rock Pigeons depend on humans for food and nest sites resulting in little competition with native birds. They are not protected by the Migratory Bird Treaty Act. The "crop milk," which both parents produce and feed to the young, contains more fat and protein than human or cow's milk. Homing pigeons are domestic Rock Pigeons and their ability to find their way home from long distances is well known. They can even navigate their way home from a distant locatin blindfolded by sensing the earth's magnetic fields! Interesting, wild Rock Pigeons are non-migratory and rarely travel far from their breeding areas. In both World War I and II, Rock Pigeons, also known as carrier pigeons, carried vital messages for the U.S. Army Signal Corps. Charles Darwin kept pigeons and it was his observations on the creation of different pigion breeds that helped lead him to some aspects of his theory of evolution. Best places to see in Tennessee: Rock Pigeons can be found statewide at urban and industrial centers, and agricultural areas. Johnston, Richard F. 1992. Rock Pigeon (Columba livia), The Birds of North America (A. Poole and F. Gill, eds.). The Academy of Natural Sciences, Philadelphia, PA, and The American Ornithologists' Union, Washington, D.C.